Description: Getting authority to head east to Pasco from Ellensburg on a snowy winter day. Description: I still love this Heritage scheme. Description: Pulling the grain train out of the valley. Description: Charging by with a Z in tow. Description: An eb manifest is entering the yard, while a wb stack is waiting to go west. Title: BNSF 1038, BNSF's Aurora Sub. 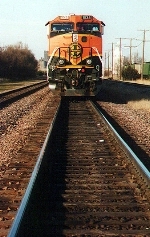 Description: BNSF V-CHCTAC. Lock & Dam #-9 is in the Background. Description: The shadows are getting long at Walong as yet another in a long procession of southbounds coils through Tehachapi loop. Description: The grain power picked up the L CHI107 at Peoria.